You may be trying to reduce the number of carbohydrates you are consuming on a daily basis to keep your macros in check. 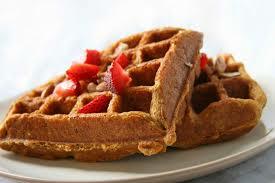 That doesn't mean you can't enjoy some yummy foods, like waffles! There are so many great recipes that substitute almond or coconut flour for refined wheat flour and they are fantastic! You can google "Paleo" or "Grain Free" anything and find recipes even the pickiest of eaters will enjoy. I want to know how we ever survived without the internet! Since there is only one person in my family who really enjoys cooking...and she's in school most of the day...we like to keep things simple. Our go to recipe for waffles is as follows, but check out The 16 Best Paleo Waffle Recipes for some additional sweet as well as savory options. Enjoy!